Cabrillo High School celebrated the launch of the Port of Long Beach Academy of Global Logistics recently during a ceremony at the school. The partnership between the Long Beach Unified School District and the Port combines academic curriculum with real-world training to help prepare Cabrillo students for college and high-paying, high-demand jobs. The four-year academy is one of many career pathways offered in local high schools and builds on the nationally recognized Long Beach College Promise by helping students to earn certifications and degrees offered by Long Beach City College and California State University, Long Beach. “We are very proud of the work everybody is doing for the Long Beach College Promise,” Board of Harbor Commissioners Vice President Lou Anne Bynum said. “Our port has made a commitment to education and our community because we understand the importance of investing in future leaders,” Bynum said. Students will learn about Port operations, including supply chain technology, security, and maritime, rail and distribution warehouse operations as they interact with industry experts and participate in job shadowing and summer internships. 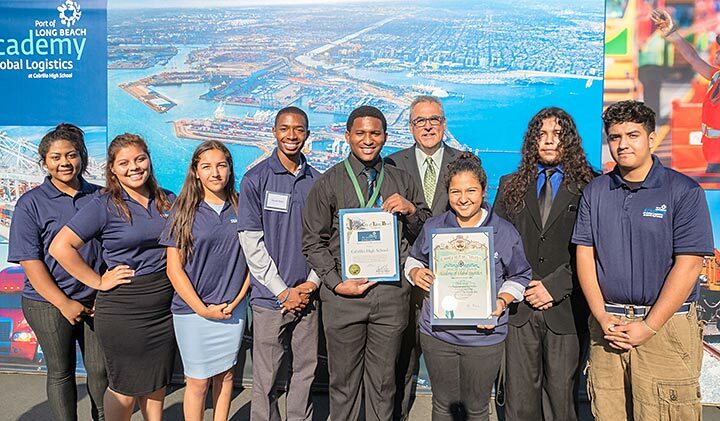 NEW ACADEMY – Students at Cabrillo High School help to celebrate the launch of a new Global Logistics Academy in partnership with the Port of Long Beach.